Download "The New Leaders Transforming the art of leadership into the science of results"
1 The New Leaders Transforming the art of leadership into the science of results By Daniel Goleman, Richard Boyatzio and Annie Mckee Great leadership works through emotions. When leaders drive emotions positively, they bring out everyone s best. The authors call this resonance. On the other hand, when emotions are driven negatively, it leads to dissonance. Emotions are important because of the open loop nature of the limbic system. Unlike a closed loop system which is self regulating, an open loop system depends largely on external sources to manage itself. People rely on connections with each other for their emotional stability. Especially, people tend to take emotional cues from their leaders. Leaders tend to speak more. They are also observed more. 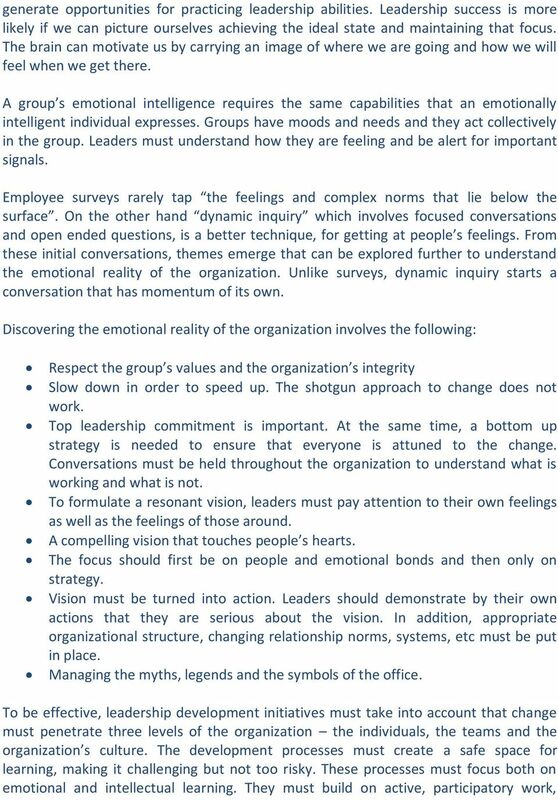 In short, leaders set the emotional standard of the organization. A leader s moods and emotions send strong signals across the organization. Negative emotions must be controlled. Anger, anxiety and a sense of futility can powerfully disrupt work and hijack attention from the task at hand. Negative emotions not only erode our mental abilities but also make people emotionally less intelligent. A person who is upset finds it difficult to be empathic as she has trouble in reading the emotions of others around them. On the other hand, positive emotions bring out the best in people. They become more optimistic about their ability to reach their goal. Their creativity is enhanced. They become more helpful. In short, the climate, i.e. how people feel about working at a company, can account for a significant part of the company s business performance. In turn, how employees perceive the organizational climate can be traced to the actions of the leader. When leadership is resonant, followers become upbeat and enthusiastic and vibrate with the leaders. Resonance amplifies the emotional impact of leadership. When leadership is dissonant, people have a sense of being continually off key. 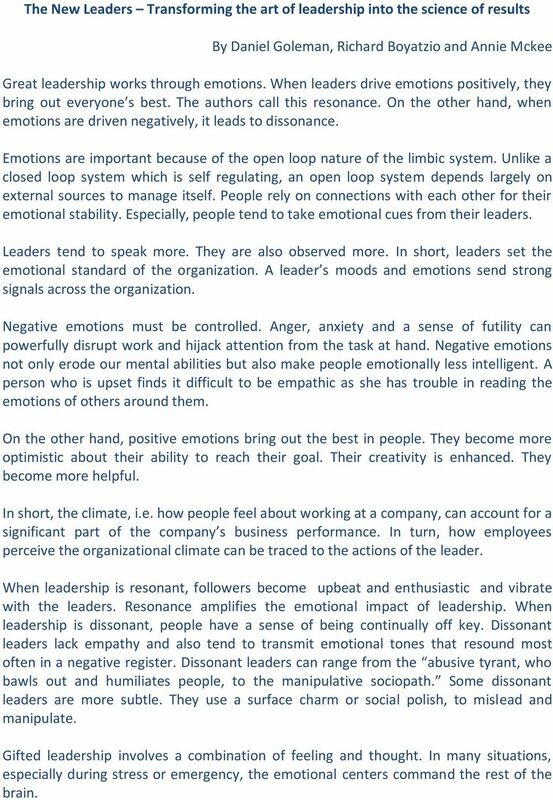 Dissonant leaders lack empathy and also tend to transmit emotional tones that resound most often in a negative register. Dissonant leaders can range from the abusive tyrant, who bawls out and humiliates people, to the manipulative sociopath. Some dissonant leaders are more subtle. They use a surface charm or social polish, to mislead and manipulate. Gifted leadership involves a combination of feeling and thought. In many situations, especially during stress or emergency, the emotional centers command the rest of the brain. 2 Emotional Intelligence has four components: a) Self Awareness: This means having a deep understanding of one s strengths, limitations, values and motives. People with high self awareness are honest with themselves about themselves. They are realistic, neither overly self critical nor excessively optimistic. Self reflection and thoughtfulness are two common attributes found in these people. Such people reflect things over and do not react impulsively. b) Self Management: This covers attributes like emotional self control, transparency, adaptability, achievement, initiative and optimism. Self management is needed to control our feelings, facilitate mental clarity and provide controlled energy. c) Social Awareness: Includes empathy, organizational awareness and ability to serve client/customer needs. By being attuned to how others feel, a leader can say and do what is appropriate, to calm fears, assuage anger or join in good spirits. Empathy includes easy approachability, ability to listen and responding suitably. Empathy is often the key to retaining talent. d) Relationship Management: This involves influencing, developing others, change management, conflict management, building bonds and teamwork. Handling relationships is about moving people in the right direction. Effective leaders switch leadership styles depending on the situation. 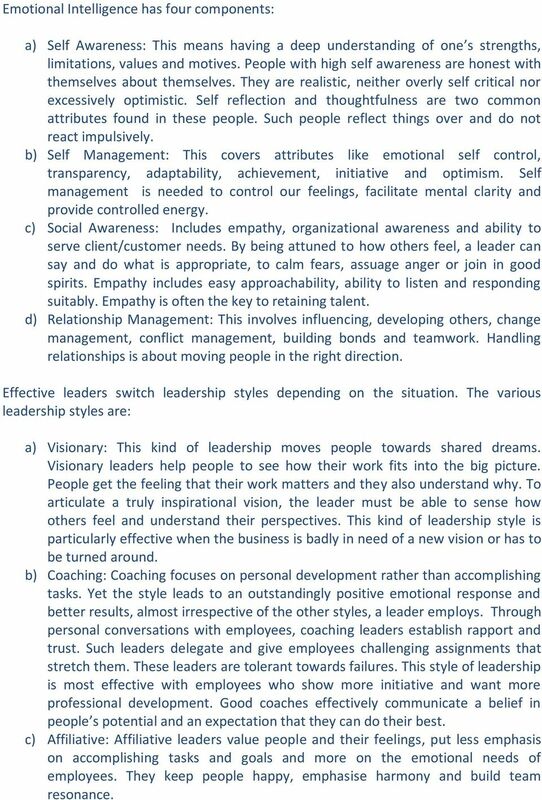 The various leadership styles are: a) Visionary: This kind of leadership moves people towards shared dreams. Visionary leaders help people to see how their work fits into the big picture. People get the feeling that their work matters and they also understand why. To articulate a truly inspirational vision, the leader must be able to sense how others feel and understand their perspectives. This kind of leadership style is particularly effective when the business is badly in need of a new vision or has to be turned around. 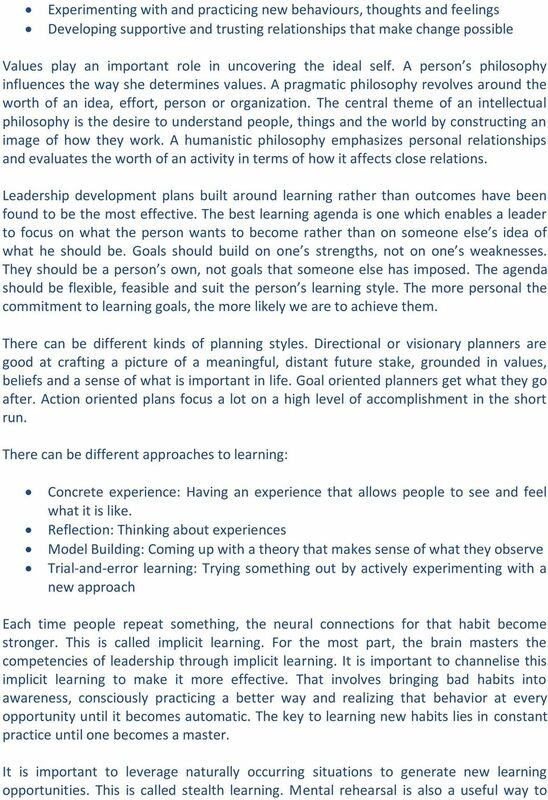 b) Coaching: Coaching focuses on personal development rather than accomplishing tasks. 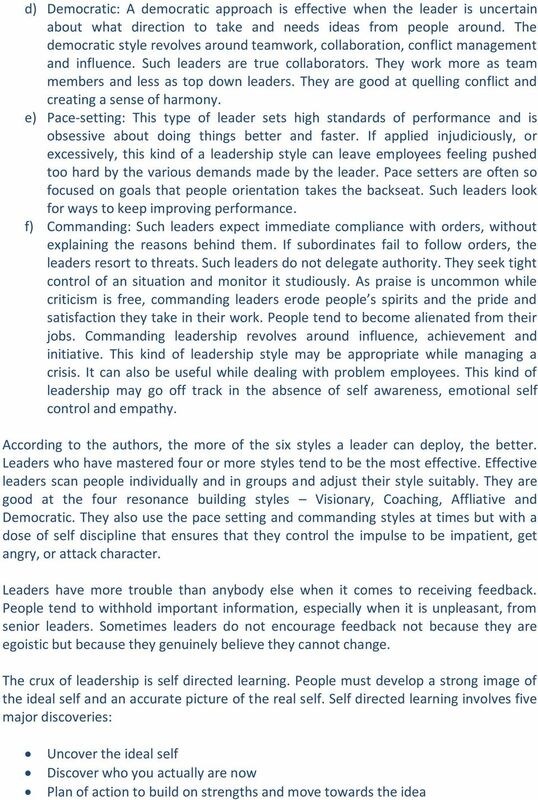 Yet the style leads to an outstandingly positive emotional response and better results, almost irrespective of the other styles, a leader employs. Through personal conversations with employees, coaching leaders establish rapport and trust. Such leaders delegate and give employees challenging assignments that stretch them. These leaders are tolerant towards failures. This style of leadership is most effective with employees who show more initiative and want more professional development. Good coaches effectively communicate a belief in people s potential and an expectation that they can do their best. c) Affiliative: Affiliative leaders value people and their feelings, put less emphasis on accomplishing tasks and goals and more on the emotional needs of employees. They keep people happy, emphasise harmony and build team resonance. 6 action learning and coaching where people use what they are learning to diagnose and solve real problems in their organizations. They must leverage experiential learning. Conclusion Emotions matter tremendously for leadership. 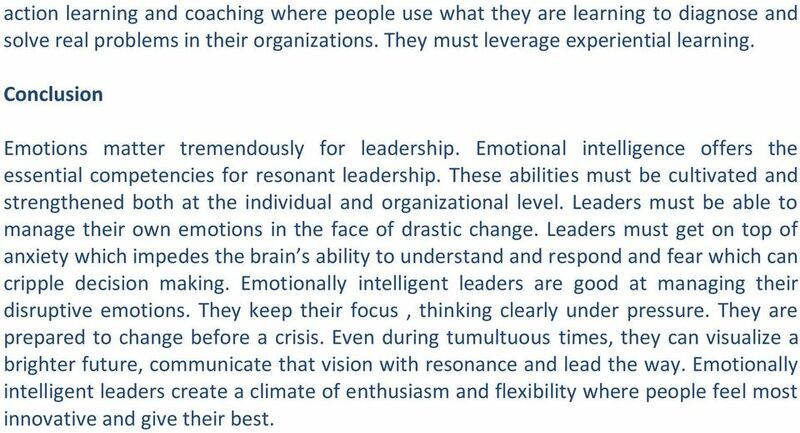 Emotional intelligence offers the essential competencies for resonant leadership. These abilities must be cultivated and strengthened both at the individual and organizational level. Leaders must be able to manage their own emotions in the face of drastic change. Leaders must get on top of anxiety which impedes the brain s ability to understand and respond and fear which can cripple decision making. Emotionally intelligent leaders are good at managing their disruptive emotions. They keep their focus, thinking clearly under pressure. They are prepared to change before a crisis. Even during tumultuous times, they can visualize a brighter future, communicate that vision with resonance and lead the way. Emotionally intelligent leaders create a climate of enthusiasm and flexibility where people feel most innovative and give their best. Dr. Michael Poli Worldwide Project Management 1michaelpoli@gmail.com PMI Region One Conference May 18, 2013 PMI Northern Utah Chapter Professional Development Conference May 20. 2013 Copyright 2013 Dr.
Teleos Catalog TELEOS CATALOG Annie McKee, Ph.D. is co-founder of Teleos Leadership Institute and is a Senior Fellow and Director of the Penn CLO Executive Doctoral program at the University of Pennsylvania. Are your employees: Miss Miller s Institute will train your employees in: huge benefits for your company. Heart & Hands Leadership Development Workshops Teaching Timeless Skillful leadership is the key to attracting, motivating and retaining the most talented people and it s the key to building performance. OUR MISSION. WE HELP YOU TO ACHIEVE WELLBEING. Your Wellbeing. The Seven Levels of Leadership Consciousness By Richard Barrett Leaders grow and develop by learning to master the Seven Levels of Personal Consciousness and the Seven levels of Organisational Consciousness. Thank you for taking a leadership role at Gustavus! Best of luck this year!